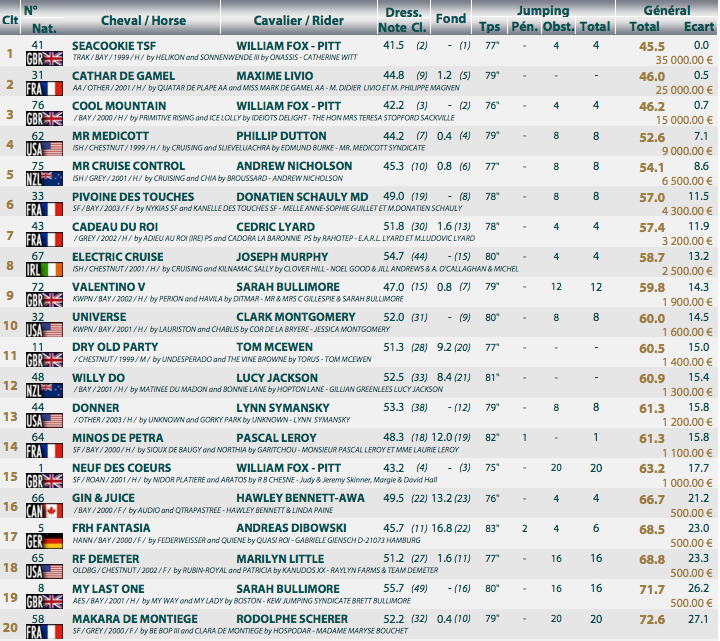 William Fox-Pitt and Seacookie TSF win Pau. Photo by Jenni Autry. 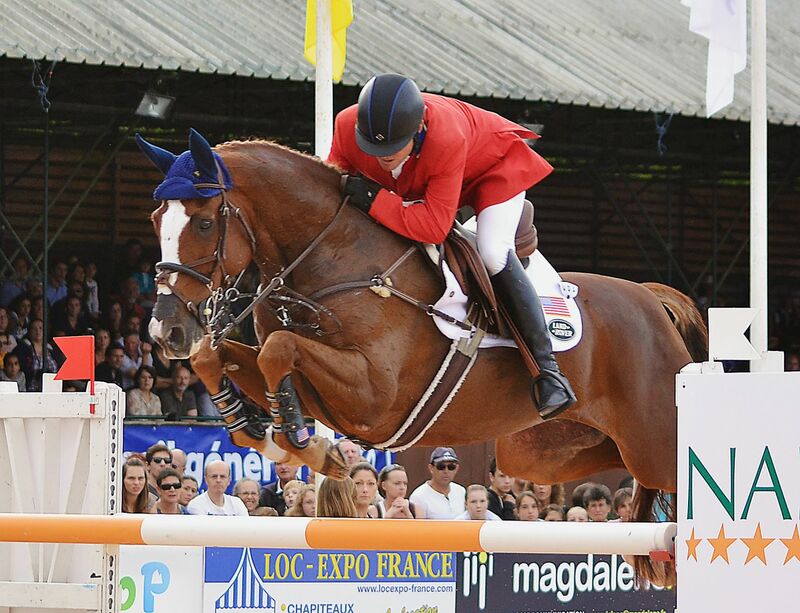 This afternoon’s show jumping finale at Les Etoiles de Pau can only be described as a wild ride. Just four pairs jumped double clear rounds in the top 30 over Bernard Basque’s course, and only seven managed to do so out of the entire field of 50 — that’s just under 15 percent. 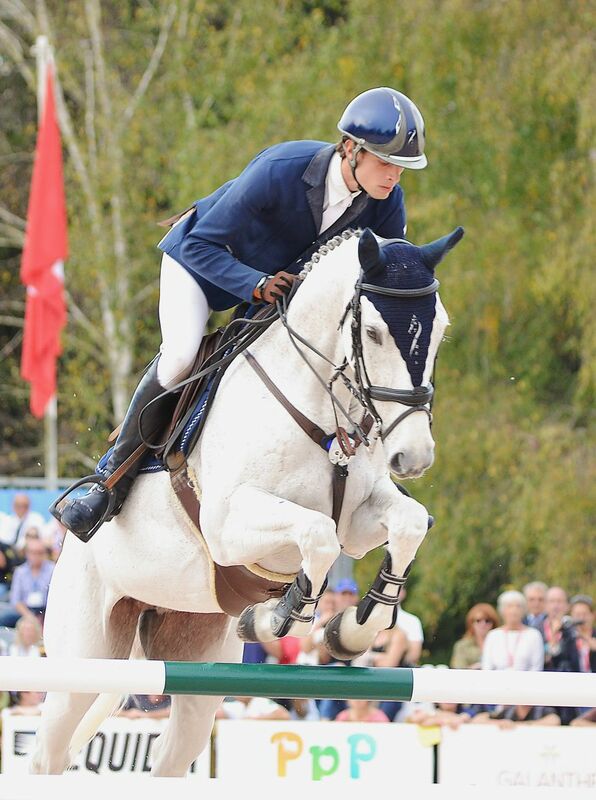 William Fox Pitt — who came into the show jumping sitting in first, second and third places — had three chances to deliver a clear round, and he couldn’t pull it off, dropping a combined seven rails between his three horses. But he had a rail in hand as the final rider of the day with Seacookie TSF, and while he ended up needing it, he stills wins Pau on a final score of 45.5. This horse has previously finished second in two four-star events at both Rolex and Badminton, and now he adds a win to his record. Maxime Livio and Cathar De Gamel. Photo by Jenni Autry. The real story of the weekend has to be Maxime Livio, a 26-year-old French rider contesting his first CCI4* on home turf this weekend with Cathar De Gamel, a scrappy little Anglo-Arabian gelding Kate and I liked right off the bat due to how hard he tried in the dressage. 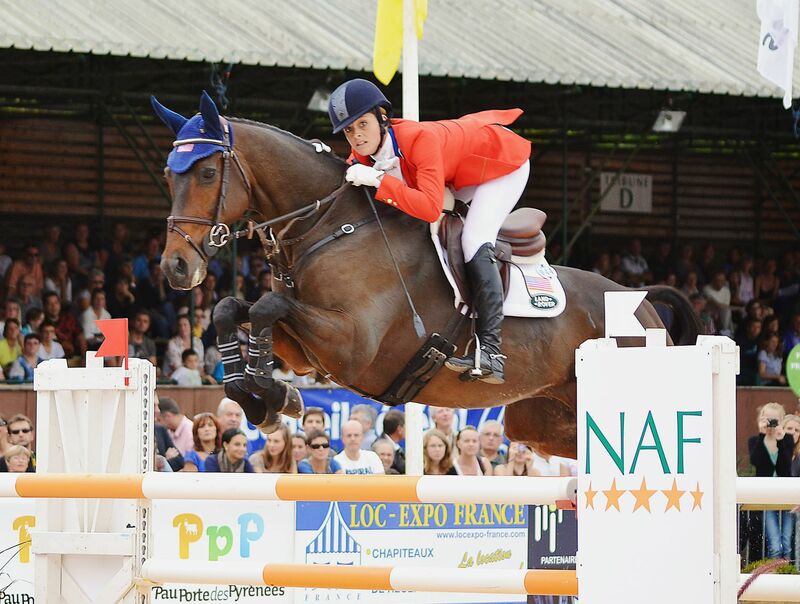 They came home clear yesterday on Pierre Michelet’s cross-country course with just 1.2 time penalties to move into fifth place, and they delivered one of the handful of double clear show jumping rounds today to finish in second place on a score of 46.0. 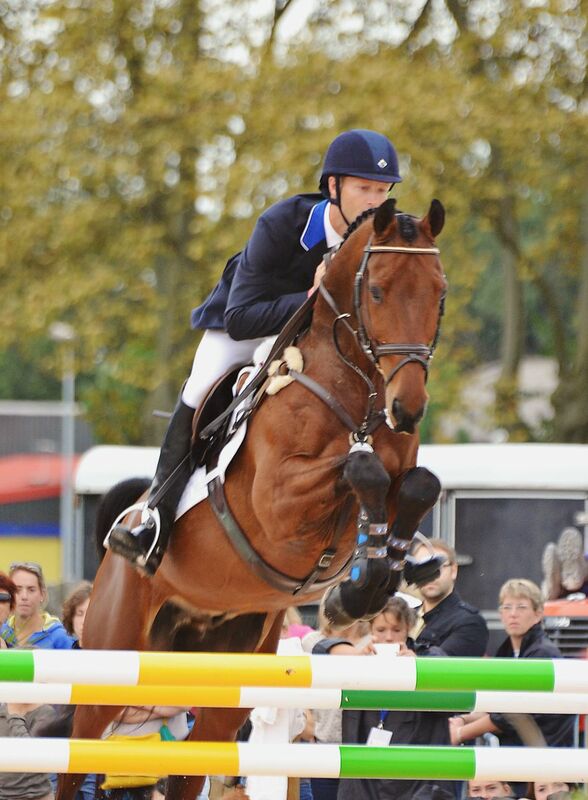 This was also the horse’s first CCI4*, and he tried his heart out once again for Maxime to jump clear today. If you didn’t get a chance to watch the press conference video from yesterday, check it out here to see more from Maxime; his English is quite good. Phillip Dutton and Mr. Medicott. Photo by Jenni Autry. Phillip Dutton and Mr. Medicott were the second to last pair to jump today, and they came into the ring right as the boisterous French crowd was going wild over Maxime’s double clear — talk about pressure. Like many of the pairs in the top 30, they pulled two rails to ultimately finish in fourth place on a score of 52.6. And, of course, I have to note that Phillip and Cave would have won had they jumped double clear — damn those rails. We finished another American in the top 10, as Clark Montgomery and Universe also pulled two rails to finish in 10th place on a final score of 60. And continuing the two-rail trend, Lynn Symansky and Donner also dropped two poles to finish in 13th on a final score of 61.3. Clark Montgomery and Universe. Photo by Jenni Autry. Hawley Bennett-Awad and Gin & Juice had the most success in the show jumping ring out of all our North American pairs, pulling one rail to finish in 16th place on a score of 66.7 for Canada. And Marilyn Little and RF Demeter round out the results for North America, pulling four rails to finish in 18th place on 68.8. It’s definitely a bummer that we didn’t get a single American around the show jumping course with a clear round, but it really was a bowling alley out there. 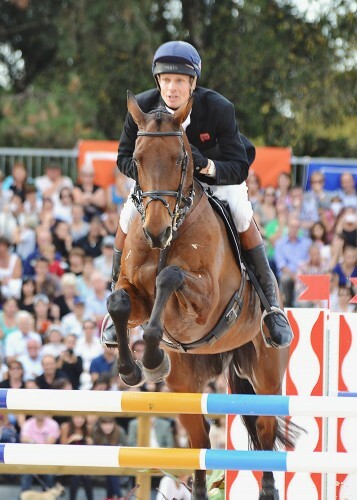 Case in point — William Fox-Pitt and Neuf Des Coeurs — who were sitting in third place overnight — were the first pair to jump in the top 30, and they went in and pulled five rails. It wasn’t easy out there. Riders ultimately needed a bit of luck to make it around the course without dropping a rail, as horses seemed to either be a bit tired after tackling Pierre Michelet’s cross-country course yesterday or rattled by the large, noisy crowds. Considering Donner jumped clear at Rolex and Universe jumped clear at Badminton earlier this spring, I’m not super concerned about the rails. 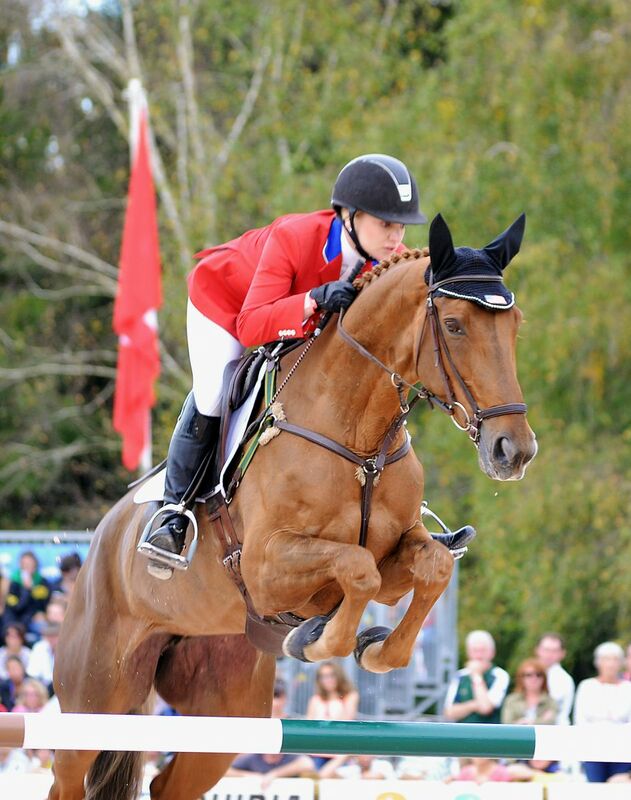 We know these horses can jump clear after a grueling cross-country course. And Mr. Medicott and RF Demeter are also excellent jumpers, so I don’t think we should be too hung up on the rails. Disappointed — yes. Ripping our hair out — no. And we certainly shouldn’t let today mar what ultimately proved to be a very successful weekend for Team USA. 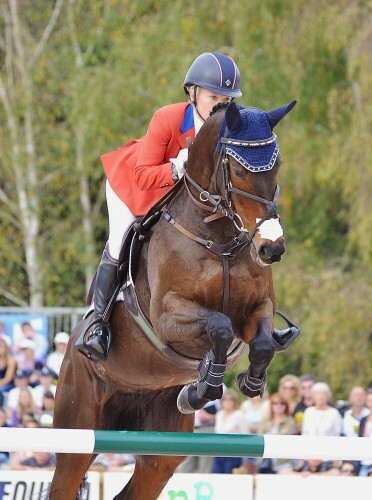 Recapping the weekend for Team USA, we had two pairs deliver very competitive dressage scores in the mid- to lower-40s, with the rest scoring well enough to put them within striking distance for cross country. And after the dust had settled on cross-country day, four clear jumping rounds rocketed our riders up the leaderboard, leaving four within the top 12 heading into the show jumping. And while all the Americans ultimately dropped two or more rails, the challenging show jumping course rode that way for most of the other riders too, which still enabled us to finish the weekend with four Americans in the top 20. I’ll have to see when we last accomplished that at a four-star event here in Europe; I imagine it’s been a very long time. Hawley Bennett-Awad and Gin & Juice. Photo by Jenni Autry. A major goal in bringing so many riders to France was to see Pierre Michelet’s cross-country course in anticipation of the World Equestrian Games next year, and we now have a very good idea of what we need to do in order to be competitive in Normandy. Pierre designs thinking courses, and they’re very different from other four-star courses we’re used to riding — as in the super massive courses with pee-your-pants fences and come-to-Jesus combinations. David O’Connor confirmed earlier this weekend that we’ll be bringing a team to Saumur again in the spring to continue gaining as much experience as we can. We still have much to learn about Pierre’s courses, but we made up a lot of ground here at Pau this weekend. Stay tuned for much more from Pau.